The Malaysian Government has announced that Service Tax at 6% is replacing Goods and Services Tax (GST) currently at zero percent (0%). This is effective 1 September 2018 onwards. Provision of telecommunication services by telco provider to end users are subjected to Service Tax. However, prepaid top-ups for Malaysians are exempted from this. Registration & renewal of Ookyo plan are currently applicable to 6% SST. You will receive a tax invoice to your registered email. SIM replacements due to faulty or lost SIMs are not subject to SST. Are there any rebates or promotions? Service Tax rebate is NOT prescribed by Ministry of Finance; hence there will be NO Service Tax rebates. 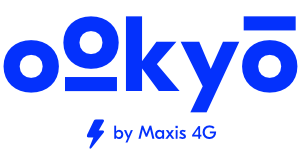 To ease you into this change in the month of September, your top-up will enjoy special rebate in FREE minutes for calls to Maxis, Hotlink, and Ookyo. How to claim: Within 24 hours of upon successful top you will receive a SMS to inform you to redeem your FREE minutes. Follow the steps.